Added: Goal Tracker and Class Reward Charts. Redownload for updated version! 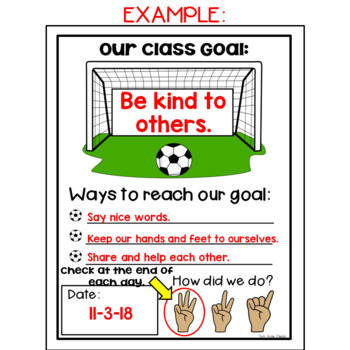 Does your class need to work on a specific goal such as kindness or respect? 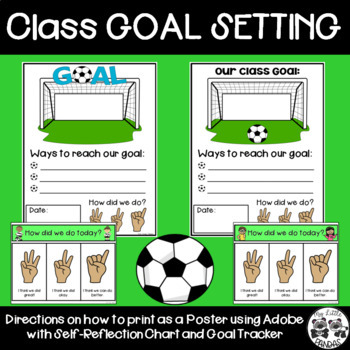 Use this Class GOAL SETTING Poster with Self-Reflection Chart and Goal Tracker to set a class goal. Print the Goal Setting Chart as a Poster using Adobe Acrobat Reader. Directions on how to print as a poster are included. Laminate the poster so it can be reused throughout the school year. Set a goal with your class and discuss ways you can meet that goal. Write the goal in the net and 3 ways to reach the goal. Each day do a self-check to see if you met the goal for the day. 3 fingers: We did great! 2 fingers: We did okay. 1 finger: We can do better. 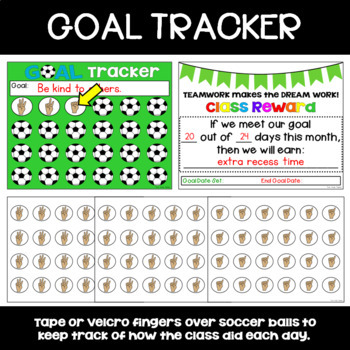 Add a corresponding finger to the Goal Tracker chart each day. At the end of the month check to see if the class reached the goal. If they met their goal, they earn the Class Reward! Follow us on TpT by clicking on the green Follow button. If you like our product, leave us feedback and earn TpT credits for future purchases!